The Straus Institute for Dispute Resolution builds on its 29-year history and continues to top the most recent U.S. News & World Report rankings as the number one dispute resolution program for an unprecedented eleven years in a row. Established in 1986, the Straus Institute grew from the first dispute resolution program in the nation’s leading mediation market to what may be the broadest and deepest program at any institution of higher learning. US News & World Report has been ranking dispute resolution programs for the past 19 years and has recognized Pepperdine as the top program 14 times. The 2016 rankings place Pepperdine at the top of list for the eleventh consecutive year, followed by Harvard University, University of Missouri-Columbia, and Ohio State. With an annual curriculum of more than forty academic courses providing a unique blend of theory and practical insights, the Straus Institute attracts not only law students and legal professionals but many from the fields of business, medicine, counseling, human resources, construction, and other arenas. The Institute’s award-winning faculty have been highly visible as scholars, policy-makers and advisors, teachers, and trainers nationally and internationally. 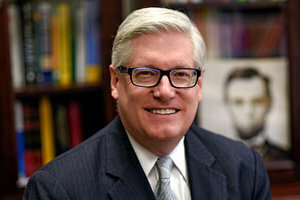 In response to the rankings release, managing director and professor Peter Robinson observed: "Straus' uniqueness is the result of the combination of an inspiring faculty, including practitioners from around the world serving as adjuncts, an accommodating administrative team, and an amazing collection of students that mixes individuals from around the world with mid-career professionals." In addition to offering academic degrees in the form of the Certificate, Master’s (MDR) and LLM in Dispute Resolution, Straus faculty regularly conduct professional skills training on six continents. In 2015, Straus announced a partnership with one of the world’s most venerable law schools, the Pepperdine-Heidelberg Collaborative, thus making its renowned LLM in Dispute Resolution more accessible for the European legal community. Straus’s Nashville Program gives students the opportunity to take its LLM courses in Nashville, Tennessee. In 2016, Straus plans to start a new pilot program offering intensive courses at the London campus, requiring only one semester of residence in Malibu. During the past year, the Institute followed up its groundbreaking 2011 survey of Fortune 1,000 corporate counsel with a broad-based survey of practices and perspectives of experienced arbitrators (co-sponsored by the College of Commercial Arbitrators) and a parallel survey of experienced mediators (co-sponsored by the International Academy of Mediators. The studies were conducted by academic director and professor Thomas J. Stipanowich, who was recently honored as the New Zealand Law Foundation’s International Dispute Resolution Visiting Scholar. "There is no place like Straus, a place that never sleeps," notes Stipanowich. "It’s everywhere, and it’s multi-disciplinary, international, grounded in reality, and constantly adapting and changing to the evolving needs of the global communities in law, business and other fields." In addition to its recognition in the U.S. News & World Report rankings, the Straus Institute and its faculty has received accolades from, among other organizations, the ABA Section of Dispute Resolution, the International Institute for Conflict Prevention & Resolution, the Association for Conflict Resolution, the California Dispute Resolution Council, the Ninth Circuit Court of Appeals, and the International Academy of Mediators. Since 2007, Pepperdine has also housed the American Arbitration Association Library and Information Center Collection, one of the world’s leading dispute resolution collections. Dean Deanell R. Tacha remarked, "The Pepperdine University School of Law is so proud of the work that the prestigious Straus Institute for Dispute Resolution does to bring informed, thoughtful, and constructive dispute resolution techniques and skills to a world where problems and conflicts cry out for such leadership. Pepperdine law students have a unique opportunity to learn in a law school that trains them in the full range of opportunities for dispute resolution."